Back cover blurb: Two sisters and one betrayal that will carry across generations . . . In wartime Cornwall, 1943, a story between two sisters begins - the story of Adele and Amelia, and the heart-breaking betrayal that will divide them forever. Decades later, the effects of one reckless act still echo - but how long will it be until their past returns? The Returning Tide will sweep you away to the beautiful Cornish coast, full of secrets and mystery, and will be loved by fans of Kate Morton and Rachel Hore. 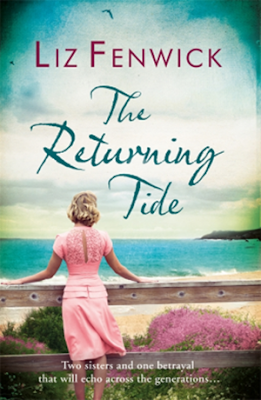 The Returning Tide is the first of Liz Fenwick's novels I have had the pleasure of reading. I know she has written many more, but this one was recommended (and appealed) to me due to its historical setting. The Returning Tide opens with limited information about something that is surely set to be hugely important to the novel. Some sort of betrayal has happened between Adele and Amelia, something unspeakable. The intrigue and tension is set for the story that follows. Adele and Amelia are identical twin sisters, coming of age as World War Two breaks out. The War leads them both in different directions for the first time in their lives. Both become WRNS or WRENs as they were more popularly known (Members of the Women's Royal Naval Service) and are given different postings. Adele is posted away from Cornwall, she has never been away from her family or her sister, and she is scared, but excited to be undertaking an important, but sensitive and secretive assignment for the war effort. Amelia is remaining in Cornwall, her work equally important, but she remains close to her family. The sisters write as often as time and the postal service will allow them, Amelia keeping Adele amused with her tales of beaus, and despairing of Adele's seeming inability to fall in love. It isn't that Adele doesn't want to fall in love, it's just that she isn't as confident as her sister and more importantly hasn't found the right man. Running alongside this tale is a time slip story set in the present day with Lara nursing her dying Grandfather in Massachusetts. He never wants to talk about the war, but Lara is so proud of him looking at his photographs and documents on his death bed that she can't help but push him a little. Her pushing leads her to Cornwall after his death, to discover exactly what he meant by mentioning a name she'd never heard before in his dying moments. Determined to find the truth, and discover if she may have family in Cornwall, Lara is unprepared for the treasure trove of family secrets that she is about to uncover. I don't want to say too much more, so I'll just leave you with this - The Turning Tide is a beautiful novel, and Liz Fenwick now a firm favourite on my 'to read' list of authors. The Returning Tide is available now via Amazon online and all good book shops.